Not everyone needs a license to fight for justice! In a superpowered society, there is nothing ordinary about evil anymore. Heroes, trained and licensed to protect and defend the public against supervillains, stand above all the rest. Not everyone can be a hero, however, and there are those who would use their powers to serve the people without legal sanction. But do they fight for justice in the shadows, or for reasons known only to themselves? 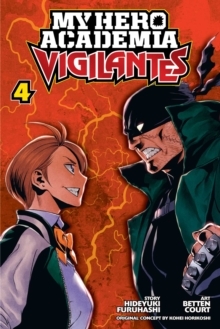 Whatever they fight for, they are called...vigilantes. The sinister Hachisuka continues to haunt the Naruhata district, distributing the Quirk-boosting drug Trigger. Knuckleduster continues to track her and is closing in. Meanwhile, Pop Step receives an unexpected invitation to perform at the Marukane department store's grand reopening. With Makoto helping out, it's going to be nothing less than an all-out entertainment extravaganza! But that's only if she can organize a disorganized group of performers in time for the show!